It may be cold outside, but there's still plenty to do this month, especially if you have kids on school holidays. 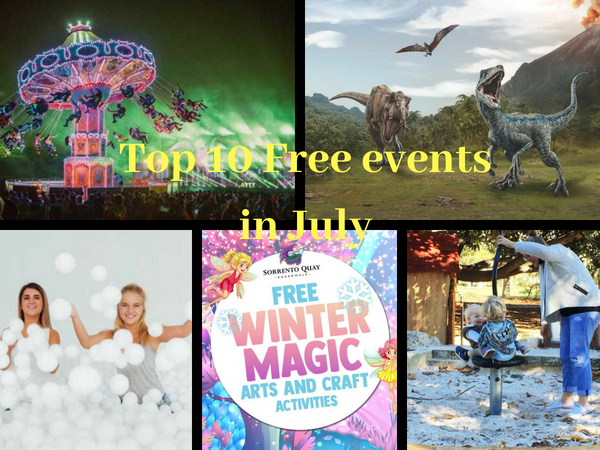 From free movies to interactive art, a giant ball pit, actual snow falls, theatrics and music festivals, kids workshops and more, you should definitely check out the program of free events in the city (and the almost free DreamSwinger at Elizabeth Quay for a gold coin donation). Bring the family and get along to this free event that runs from 10am to 3pm. There will be craft and DIY, market stalls, vintage lawn games as well as plenty of food trucks and even a pop-up bar selling mulled wine and hot chocolate. Fancy a wander in South Perth on a Sunday morning, surrounded by the buzz of music, kids craft activities, market stalls, fresh food, and more? Or simply visit for the range of delicious foods. Make sure you follow the FB page to see if there are any changes due to weather. First things first – the ice skating at Winterworld is not free ($15pp, under 5s free) but there are a number of free activities that will be happening in and around the pop-up outdoor skating rink: including free craft activities for kids, roving entertainers, circus fun, ice skating demos and more. The latest Jurassic World movie may be 13 but that shouldn't stop you bringing littlies along to Whitford City with their dino themed school holiday activities including stage shows, a dino-dig, craft activities, dining with dinosaurs and more. And at the other end of the metro area, kids can head to Cockburn Gateway for a range of free school holiday activities including a jungle adventure trail, vet hospital, jungle crafts and more. Check out the daily program and head along to Sorrento Quay for a host of free activities including snow fairy garden making, snow flower crowns, make your ow dream catcher, sculpt an ice dragon and more. Two new playspaces will be unveiled – one designed for toddlers and the other for 8-12 year olds. Kids will be able to explore these fabulous new playgrounds as well as enjoy free craft activities such as making flower crowns and collages. The Claremont Community Library will be hosting a number of free events in the July school holidays, clothing upcycling workshop, worm farms, Japanese and French storytime and more. Bookings essential. Too numerous to list, there's a good chance your local council or library will be hosting free activities for kids during the school holidays. Check them out asap because many book out in advance.